Fest Info: The Zest is back again!!!! 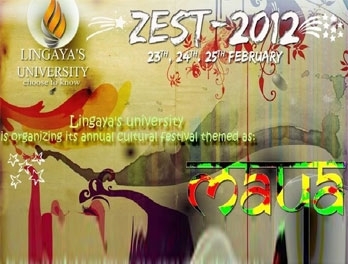 We at Lingayas University will be celebrating the ZEST-2012 from 23rd – 25th February,2012 as MAAYA-ILLUSION.As the month of February sets in, Lingaya’s University (formerly known as LIMAT) is ready to roll up its sleeves to make our annual cultural festival ZEST a grand success. ZEST has remained a symbol of fine artistry showcased by all the students. It has endowed them with a platform to exhibit their talents and hard work. ZEST accentuates the creativity and ingenuity put forward by all to create a magical aura of enthusiasm and ebullience. The Theme of ZEST Will be MAAYA-ILLUSION.